Jackson joins a long line of black quarterbacks who have fallen victim to implicit bias in NFL Draft analysis. 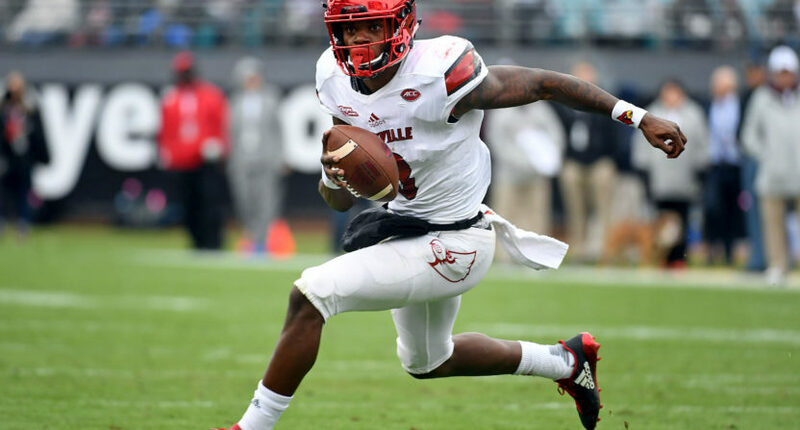 As the NFL Draft creeps closer, Louisville quarterback Lamar Jackson has emerged as the most divisive player in the 2018 class. To some analysts, the former Heisman Trophy winner is a flawed but dynamic weapon who has proven his ability to play quarterback. To others, Jackson is simply a college star who lacks the skill set to last in the NFL. Already, with the draft still more than two months away, ESPN’s Mel Kiper Jr. has drawn fire for criticizing Jackson’s completion percentage, even while saying stats don’t matter when it comes to fellow signal-caller Josh Allen. Kiper’s ESPN colleague Bill Polian, meanwhile, sparked backlash when he suggested Jackson should switch to wide receiver. On Thursday night, football writers Chris Brown and Greg Gabriel engaged in a somewhat surreal debate about whether Jackson played in a pro-style offense at Louisville. If all of this sounds a bit familiar, it’s because we’ve been here before with quarterbacks who don’t, you know, “look” like traditional quarterbacks. Specifically, with black quarterbacks. Remember when Cam Newton was described as “fake” and “selfish” by an anonymous scout? Or when Cardale Jones was compared to JaMarcus Russell and dissed as “not the brightest cookie in the world?” How about when Geno Smith was slandered as “not a student of the game?” Or when DeShone Kizer was criticized for “diva qualities?” Or when national champion and two-time Heisman finalist Deshaun Watson was dinged for being inconsistent from the pocket? Sometimes, virtually every black quarterback of the 21st century is summarily written off because “dual-threat quarterbacks … rarely have long-term success.” Other times, a “run-first” label is applied to black guys who don’t even run that much. Frequently, black quarterbacks are asked to change positions before arriving in the NFL. Reliably, they are compared exclusively to other black quarterbacks, even when more fitting cross-racial comparisons are available. We need not rely on mere anecdotes. The Guardian found last year that black quarterbacks are drafted lower on average than their white counterparts but perform better in the league, suggesting they’re systemically undervalued. A Washington Post study discovered that draft scouting reports disproportionately mention white quarterbacks’ intelligence and leadership, while harping on black quarterbacks’ physical skills and mental deficiencies. It is an empirical fact that quarterbacks of different races are not treated the same in pre-draft evaluation. To be clear, we’re not alleging that Kiper and company are racists who can’t stomach the idea of a black man playing quarterback in the NFL. By and large, people who dismiss Jackson as a pro prospect are probably doing so in good faith. They think they’re providing sharp analysis based on decades of watching football. What they don’t seem to realize is that they’re transparently evincing bias against players who don’t fit the traditional schema of an NFL quarterback. For decades, most NFL signal-callers have been white, meaning that when people close their eyes and imagine the ideal QB draft prospect, they often envision someone who looks more like Peyton Manning and less like Deshaun Watson. And when analysts fail to check that bias, they wind up hyping tall white dudes at the expense of everyone else. They wind up fawning over Josh Allen’s ineffable qualities while playing down Jackson’s obvious ones. Maybe Jackson will be a bust. Maybe his supposed lack of accuracy will doom him in the NFL or his tendency to scramble will prevent him from staying healthy, just as Kiper and others suggest. That still won’t change the fact that a large portion of the dialogue around Jackson lately has been hypocritical and foolish. And it certainly won’t absolve the years-long pattern of NFL quarterback prospects being talked about differently depending on what they look like.